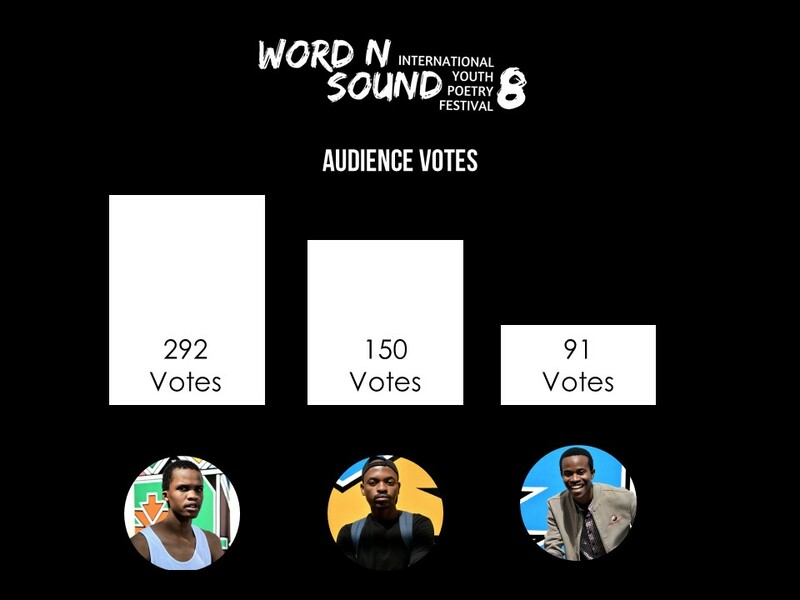 The Response Poem round is one we eagerly await each year at the Word N Sound Poetry League Finale. The finalists are given a list of poems that they are asked to respond to in any way. It’s always amazing to see how they interpret and reimagine existing work fusing themselves, their experiences and their style into another poet’s work. The original poems were played beforehand to give the audience and judges context. Masai Sepuru performs a response to Koleka Putuma’s “Water”. Linda Masilela responds to Luka Lesson’s “Antidote” performs at the 8th Word N Sound International Youth Poetry Festival in Newtown Johannesburg. Having been eliminated in previous rounds, both Mjele Msimang and CLear got to present the poems they had worked on too at the Word N Sound Festival. Mjele Msimang responded to Quaz Roodt’s “Beware”. Clear was drawn to Joshua Bennett’s “Chariots” when selecting a poem to respond to. The audience votes were added to the judge’s totals from Round 1, Round 2 and this final Round to give us the final Season 8 Poetry League finale scores.